Different upholstery requires different cleaning techniques. 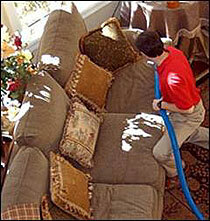 Our technicians will recommend the appropriate cleaning method for your upholstery job. If your upholstery is simple to clean and involves little risk, our prices will reflect that ease of operation. For more delicate and valuable upholstery, which obviously requires more difficult procedures, our price will be somewhat higher. Having your carpet cleaned by the professionals at Diamond is a great investment. Not only do you have the peace of mind that you and your family are breathing easier, but nothing brightens up a home like fresh, clean carpets and upholstery. Like your carpets, your upholstery sees a lot of action. Over the years, things are spilled on it, the pets sleep on it, and the kids jump on it. You usually can't stop all of this from happening, but you can minimize the appearance of it. It will help resist spills, staining and ultraviolet radiation, all of which dull the appearance of your upholstery. Why not protect that investment by having our staff of trained professionals apply fabric protector? Show your leather some love! 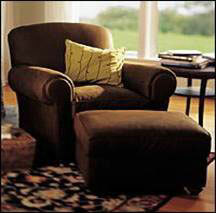 Oils in your leather upholstery will dry out and evaporate, even when the furniture is not regularly used. To keep the leather soft and flexible, dirt and grime must be periodically removed and the oils must be periodically replaced-- usually about once every year. Let Diamond restore and protect your leather and it will last you many years!